I, Jourdan Cameron, have written a book. The title of the book is Me2 (sometimes written as Me Squared to prevent formatting issues with the superscripted 2). It’s a book that’s been sitting in my head for a very long time. It all started one night about six years ago; I was lying awake in bed, staring up at my ceiling, when I came up with the idea for a book about a kid who discovers that he has a clone. The title of the book was originally going to be Blood Brothers. What’s funny is that today, I’m not sure what came to me first- the title, or the idea. Did I think of the name Blood Brothers and think about some way to give it meaning? Maybe I came up with the book idea and thought that Blood Brothers would be a fitting title. As for the book itself, it’s a little unconventional. I wanted to write an exciting book that wasn’t completely composed of dumb action- I don’t have anything against action, as there’s plenty of it in Me2– the thing is, I wanted to make something for young audiences with depth, something that they would find engaging, thought-provoking and accessible. It’s far too easy to get caught up trying to make something with a specific quality that those other vital elements of a book become lost in a sea of dry words. So while I would say that this is a thought-provoking book full of depth, it’s also a fun book full of life. I think a mistake that’s made too often is that when a writer wants to get a message across, or even just wants to write a story, he or she will harp on one thing, and one thing only. While I loved the central message in the movie Won’t Back Down, I really hated the movie. It was well cast and all, but it only conveyed a single thing- it felt like I was being force-fed the idea that the whole educational system is broken and we need a revolution to fix it and the entire world is a villain except for anybody who’s not fighting with us. While it’s pretty true that there are some big issues with various school systems today, I didn’t get anything else out of the movie. I couldn’t be brought to care about the characters, their plight, and I certainly didn’t wind up feeling whatever it was that the film’s director wanted me to feel. I think it’s safe to say that I dodged that bullet with Me2. 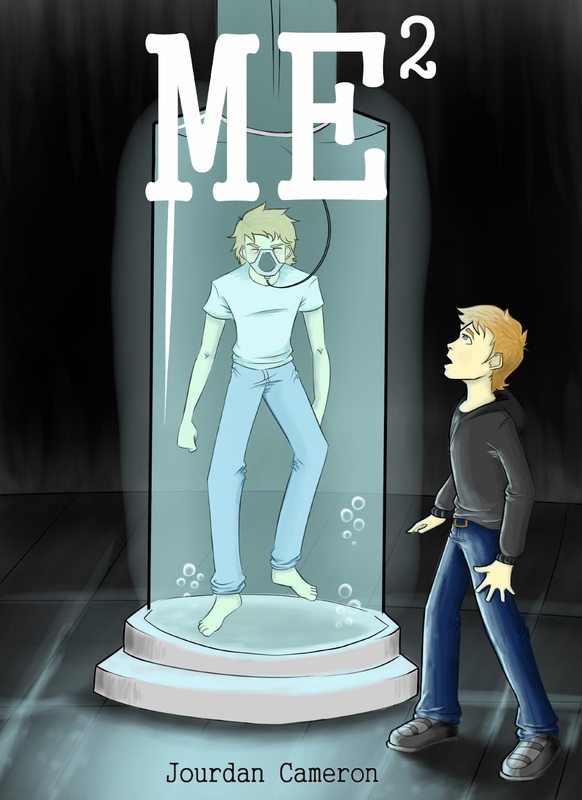 While I did write with the purpose of making kids think about the ethics of such things as cloning and genetic engineering, I also worked hard to create a worthwhile story, interesting characters, and all those other things that I believe make a book worth writing and, subsequently, worth reading. I’m very proud of my sister, Kassidy Cameron- she created the book’s front cover. I told her what I wanted to see and she brought it beautifully to life. If you’d like to see more of her work and also help out our aunt, please be sure to take a look at her site! Me Squared will be available to purchase this November.